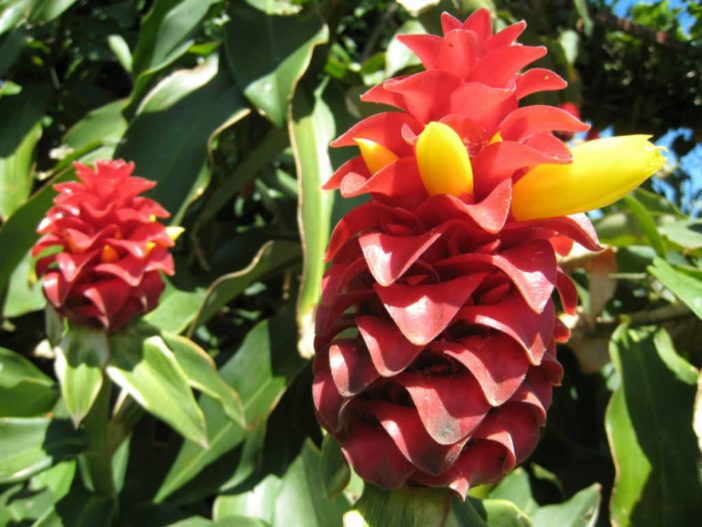 Costus is an uncommon plant in the landscape trade, especially in temperate and colder areas. And that’s a shame. This relatively large genus of about 100 tropical plants was once classified with the gingers, but has since been moved into its own genus. They range throughout the tropical world and grow with large, fleshy leaves that are arranged in whorls around the stem. The flowers emerge from the center of the plant in a small cone with ruffled, crinkled flowers. Like many plants with fleshy leaves, they have a truly tropical appearance, which belies their relative ease of growth. These are much more cold hardy than some of the other tropicals and can even be grown outside into Zone 8, although they might die back during the colder months. Indoors, it’s best to focus on juvenile plants because the more popular species among them tend to grow fairly large. They are rhizomatous plants (meaning they grow from an underground rhizome), which makes propagation a snap. Light: They like morning sun exposure, so an eastern window is perfect. Plants that receive more light should get correspondingly more water. They can be acclimated to full sun and will frequently appreciate a summer on your balcony or porch. Water: They require copious and regular amounts of water. Never let the soil dry out, even during the winter season. Do not, however, let them sit in waterlogged soil or the rhizome could rot. Fertilizer: Feed weekly with a weak liquid fertilizer that includes micronutrients. They are heavy feeders, especially during the growing season. Soil: A light, fast-draining potting soil is perfect. Depending on the species, you’ll probably need to repot your Costus annually, in the beginning of the growing season. If you want to keep it a manageable size, use this as an opportunity to divide the rhizome and refresh your potting soil, but keep it in the same size pot. Some of the larger species can grow to 10 feet (3 m) or more, so be aware of the potential size issue. They can be propagated by leaf cuttings, but by far the easiest way to propagate a costs is to divide the rhizome or take a piece of it. When dividing the rhizome, look for a piece that’s actively growing or just emerging from the soil. Separate it from the parent plant and repot into a new pot with fresh potting soil. Keep warm and moist, but do not expose to full sun until the first new growth emerges, then you can begin to move it into a sunnier location. Costus fall into the tropical category, so if you do well with philodendrons and other tropical plants, you should be able to grow Costus without too much issue. They aren’t terribly picky about their light, but the key to successful growth is lots of water and lots of fertilizer to keep up with their heavy demands. If your plant starts to suffer from brown leaf margins, it most likely is being underwatered or exposed to cold drafts. Try to raise the humidity and increase the water. Costus are susceptible to mealybugs and aphids. Keep a careful eye on your plants and inspect them to catch infestations early and treat immediately. Severely infected plants should be discarded.